Last Friday, I stood near the Lenca people’s sacred Gualcarque River with Tomas Gomez, who has assumed the coordination of the Council of Popular and Indigenous Organizations of Honduras (COPINH), following last month’s assassination of Berta Cáceres. We tried to figure out how to get everybody in the Gualcarque River to safety amidst a violent attack occurring just up the hill above us. Armed men affiliated with DESA, the company building the Agua Zarca Project, were swinging machetes, throwing rocks, and punching COPINH leaders and attendees of the International Encuentro “Berta Cáceres Lives” as they peacefully walked back to their buses following an Indigenous ceremony on the edge of the Gualcarque River remembering Berta and her struggle. The violent men were searching for Tomas, yelling “we must attack him, he’s the one who’s left.” They also made references to having murdered Berta Caceres and that the people there were all that were left. COPINH leaders Sotero Chaverria, Jose Asencion Martinez, and Marleny Reyes Castillo were all attacked and injured. A TeleSur journalist was hit and threatened and Vitalino Alvarez, long-time leader of the Bajo Aguan campesino movement, was punched in the face so badly he could barely open his mouth. An international accompanier was punched and knocked down. Several other Encuentro attendees were also injured. Notably, the US-funded and supported Honduran National Police in the area did not disarm the men nor stop the violence. In fact, earlier in the day, they refused to disarm the men as they threatened the Encuentro participants who arrived to walk down to the river. After intense pressure from COPINH leaders, the police assisted those still down at the Gualcarque River to get past the group of armed men, but released them not far from the armed men, who started coming after them. The police refused to disarm those swinging machetes and punching the Encuentro attendees. The Honduran military was also in the region, but they were deployed at entrances to DESA’s installations, showing once again their role is to protect corporate interests. Among the DESA-affiliated men identified by local residents was a known hitman with a murder in his police record who had previously threatened to kill 10 COPINH members, including Berta. Just two weeks before her death, Berta had denounced that this man was working for DESA and had been released from police custody despite having a murder in his file after DESA’s head of security moved money around. Other men are reported to be paid by DESA or the local government to intimidate COPINH and provoke violence. This attack is just the latest in a long line of violence against COPINH members who defend the Gualcarque River. They have been attacked with machetes, murdered, hospitalized, criminalized, threatened with death, and shot at since they started blocking construction of the dam in April 2013. The Honduran military murdered Tomas Garcia, shooting him multiple times at close range at a protest against the dam. With the second attempt to build the dam in 2015-2016, the threats and violence have increased. 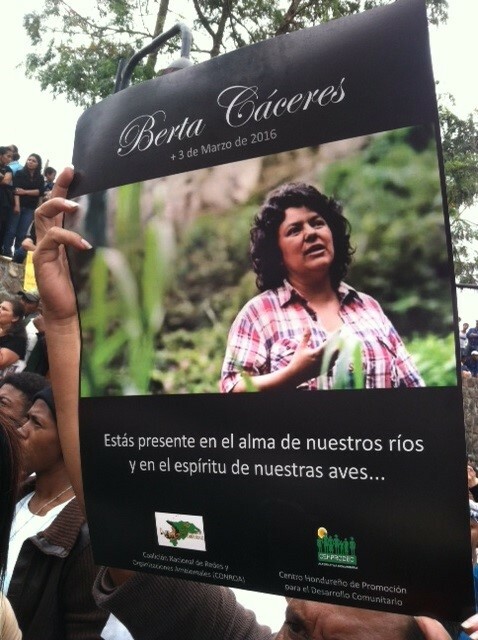 On March 2, 2016, Berta Cáceres was assassinated after years of threats. 24 hours after Berta’s death, 4 men with high-caliber weapons appeared just before midnight near the home of Berta’s close colleague, Tomas Gomez. Francisco Javier Sanchez, President of the Indigenous Council of Rio Blanco, the Lenca community opposing the dam, has been followed, and the National Police took away the bus the Rio Blanco residents were traveling as they tried to go to the protest demanding justice for Berta. Mysterious people have appeared taking pictures near COPINH’s installations. The US has a direct responsibility for the repression occurring in Honduras. When Hillary Clinton was Secretary of State, she legitimized the 2009 SOA-graduate led military coup. Clinton refused to call it a military coup, meaning US aid could continue, and instead of demanding the coup regime allow the return of the democratically elected President, she sought to bring about elections carried out by those who had just seized power and which of course simply gave them a hold on power. The coup and subsequent regimes unleashed intense repression against social movements, human rights organizations, lawyers, journalists, LGBTQ persons, and anyone who speaks out. The $750 million approved by the US Congress for the “Alliance for Prosperity,” known as the Plan Colombia for Central America, will only make things worse, providing a huge influx of funding to the repressive Honduran regime with a lethal combination of support for the security forces and exactly the type of privatization and corporate projects that social movements are being murdered for opposing. A year before her assassination, Berta Cáceres met with US Congresspeople and asked them not to fund the Alliance for Prosperity and to cut off all military and security aid to Honduras. Unfortunately, that did not happen. The powers at be tried to silence Berta’s voice by assassinating her but her call has been taken up by people across Honduras and the world. Before more amazing leaders are killed, we must take action and demand the US cease its devastating role in the repression occurring in Honduras and cut the Alliance for Prosperity and all security funding to Honduras. Click here to send a message to your Member of Congress. TAKE ACTION: Call-in Day for Puerto Rico today!